That’s where I dropped my first Jap. I shook like a leaf every time I killed one, until I got three of ’em. I quit shaking then. Saipan is one of the largest islands in the Marianas group, about 3,800 miles from the Fourth Marine Division’s home at Camp Maui, and about 2,400 miles from Tokyo. For centuries, the island received little attention in the West–even from its colonial rulers in Spain, who maintained a small resupply station on the island. Imperial Germany purchased Saipan in 1899, but made no attempts to develop the island. Little changed for the native Chamorro population–what little remained after generations of deportation to work on Guam. Then in 1914, the Japanese arrived. It was an act of war, seizing Saipan, Tinian and Rota in the name of the Allied Powers, and the small contingent of German administrators and priests were peaceably repatriated. Five years later, the Japanese would lay formal claim to their new holdings in the Marianas, and a 1921 League of Nations mandate recognized their authority. For the next twenty years, Japanese farmers and industrialists turned Saipan into a major producer of sugar. Fields of sugarcane were planted across the island and on neighboring Tinian; raw sugar was processed in refineries at Garapan and Charan Kanoa, and exported to Japan. The lucrative industry attracted settlers in droves, and nearly 30,000 Japanese civilians lived on Saipan in 1941. Naturally, this economic development required a great deal of construction. Light rail systems were built to move tons of sugar, and engineers began building an airfield at As Lito in 1934. America, increasingly suspicious of Japan’s activities in the Pacific since their withdrawal from the League of Nations, tried a variety of means to confirm their beliefs that the island was being fortified, but found little conclusive evidence. Westerners were decidedly unwelcome in the Marianas; it was even rumored that Amelia Earhart and Fred Noonan had been captured and imprisoned as spies. Definitive proof finally came on December 8, 1941 when Japanese troops–supported by aircraft flying out of Saipan–attacked the American naval base on Guam. Two and a half years later, nearly 30,000 Japanese troops prepared to defend the former sugar colony against some 71,000 American soldiers, sailors, and Marines assembled in the largest amphibious force the world had ever seen. Untold thousands of civilians, both Japanese and Chamorro, would be caught in the middle. In the span of one month, more than 55,000 people would die on an island of less than 50 square miles. Eighty five of them were Marines of 1/24. Believe me, those first two or three weeks were just about as bad as things could be. 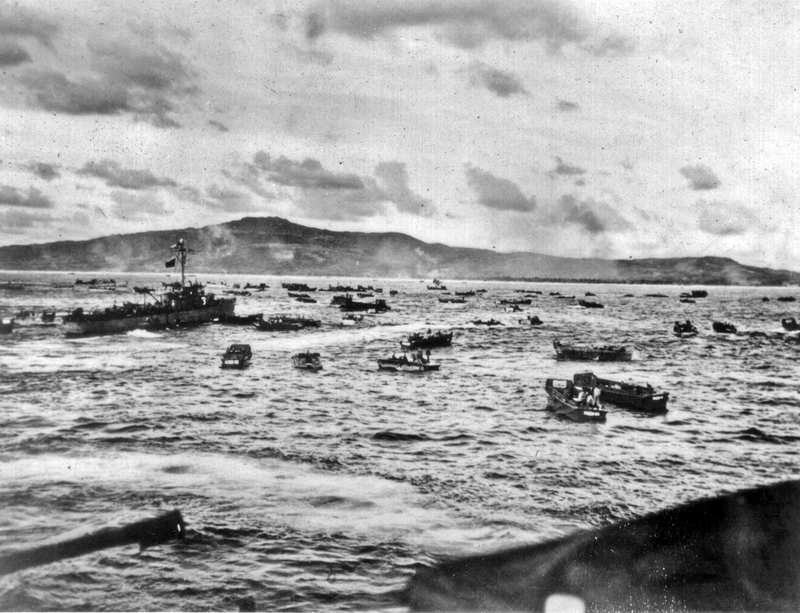 Sailing To Saipan: The USS Calvert. June 15: The Worst Experience I Remember. June 16: An Unsavory Odor. June 17: Some Things Are Hard To Live Down. June 18: Enjoyable Machine Gun Firing. June 19: Marines To My Right & Left Were Killed. June 22: A Perilous, Strength-sapping Day. June 23: The Point Of Exhaustion. June 24: Turned Again To The East. June 25: Occupation Of The Point Was Complete. June 26: To Sun And Lie In Shallow Water. June 27: Unable To Deliver Effective Fire. June 28: Ground Studded With Fortifications. June 29: Enemy Groups Filtered In. June 30: Combat Softens Any Foxhole. July 1: Opportunity To Send Out Mail. July 2: Them Snipers Can Shoot! July 3: Fish In A Barrel. July 4: Resting On Our Vantage Point. July 5: A Dozen Men Were Riddled. July 6: Anticipated, But Unwelcome Orders. July 7: Piling Them Up In Rows. July 8: With All They Had. July 10: Two-Day Southward Trek. July 13: Our Last Killing. Total Casualties, First Battalion 24th Marines. Accounts for casualties sustained between June 15 and July 13, 1944, based on muster rolls for the battalion. Includes Pvt. Marwood B. Smith (Co. B), died as a direct result of Saipan wounds on August 11, 1944. WIA: any wound caused by enemy action, qualifying for a Purple Heart. Does not count multiple wounds suffered by individuals. “Sick, Not Returned”: physical ailments not qualifying for a Purple Heart, that resulted in a Marine’s evacuation through July 14. Does not count Marines so evacuated who returned to duty on or before July 13.
looking for history and journey. lived and died a Marine! I have a bit of information about your father, PFC Robert N. Harris of A/1/24. If you’d like to email me at missingmarines@gmail.com, I’d be happy to share what I have and try to help answer any questions. My Father, Melvin T. Chrislip, Jr. was also wounded in action on Saipan. I have his story as well. I very much appreciate the most excellent work that you’ve done in gathering the data on 1st Battalion 24th Marines. I am in process of writing a book on the battle of Saipan, similar to my book on the Hürtgen Forest, where I will examine the 24th Marines, 165th Infantry and the 43d Division and 47th Independent Brigade Imperial Japanese Army; how they were organized, trained and combat on Saipan from the level of regiment and below. I am hoping to use some of the data on your site, with appropriate footnotes–so thank you again. The individual data that you have on individual Marines is wonderful. Mr. Rush, I look forward to helping out however I can. I know some researchers who specialize in the 2nd and 3rd Battalions, and would be happy to put you in touch if you would like.